I submit this project in lieu of thesis as a Master of Fine Arts candidate. 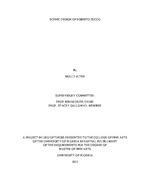 This document serves as a record of the design process for Roberto Zucco by Bernard-Marie Koltés as produced by The University of Florida School of Theatre and Dance. This production was directed by Dr. Ralf Remshardt and executed at the University of Florida in the Black Box performance space located in Gainesville, Florida. The process began in early September with one on one meetings with the director. I included an account of these meetings, group design meetings and all research leading up to the final concept and design. The appendixes contain sketches, drafting and photographs that resulted from the project. I also cover the creation of the production in relation to scene shop, budget constraints and unforeseen difficulties. A reflection on the success of the production and the process are included in the conclusion. 3 Summary of Project Option in Lieu of Thesis Presented to the College of Fine Arts of the University of Florida In Partial Fulfillment of the Requirements for the Degree of Master of Fine Arts SCENIC DESIGN OF ROBERTO ZUCCO By Molly Ilten May 2012 Chair: Mihai Ciupe Major: Theatre I submit this project in lieu of thesis as a Master of Fine Arts candidate. This document serves as a record of the design process for Roberto Zucco by Bernard Marie Kolts as produced by The University of Florida School of Theatre and Dance. This producti on was directed by Dr. Ralf Remshardt and executed at the University of Florida in the Black Box performance space located in Gainesville, Florida. The process began in early September with one on one meetings with the director. I included an account of th ese meetings, group design meetings and all research leading up to the final concept and design. The appendixes contain sketches, drafting and photographs that resulted from the project. I also cover the creation of the production in relation to scene shop budget constraints and unforeseen difficulties. A reflection on the success of the production and the process are included in the conclusion. 4 INTRODUCTION The Play dark comedy. When one takes into consideration its roots in reality, a whole host of concepts becomes available to the design team. The following information covers the entire scenic design process, starting with a synopsis and initial research. It also includes the construction progression as well as a record of meetings and how they impacted the design. The design team explored many different and varied paths far into the development phase. This approach allow ed creativity and ingenuity to take priority over bu dgets and physical limitations. The final set design possesse d a strong visual environment while maintaining fluidity through its spiral shape and seamless scene shifts. 6 strong resemblance forms between the lady with her child and Zucco with his mother. Zucco murder s the child and the lady shows only a mild concern for the loss of her son The police cowardly view the entire event from behind the gathered crowd. The twosome ends up in the railway station. The lady demonstrates a weak attempt at motherly love and Zucc o opens up about his fear of losing his identity and his mind. The girl experiences her own set of difficulties when Zucco leaves her. Her siblings beat her down ever further with their vehement disapproval. Then, her brother drags her to the police stat ion where officers threaten her to gain information. Ultimately, she has her brother take her to a brothel as a de sperate attempt to be reunited with Zucco. Police officers stake out the brothel and Zucco soon presents himself for arrest as the girl pleas for love and forgiveness. The play come s full circle as, once again Zucco breaks out of prison. In his last moments, Zucco is at peace justifying his murders as the natural order of the world. He makes his final escape as he falls to his death. 8 strong presence, a nd they all had a rough aged feel. At this point in the design process I started my interaction with the director, Dr. Ralf Remshardt so I could focus in on specific areas. 16 CREATION OF THE PRODUCTION Scenic Studio Progress The scenic studio production progress happened in phases. Due to complications with the d to the master carpenter Tony Berry. The first week of build was limited due to a lack of space. Two panel frames were constructed and contact cement was tested as a means to attach the luan facing to the steel frame. The following week the main stage bec ame available and a jig was set up to mass produce the steel framework. By the end of the week two panels were temporarily put in place. Two other panels were also on their way to completion. Both Liquid Nails and Loctite were us ed to attach the luan to the steel. Much of the shop staff had met their require d work hours for the semester. This led to a shortage of staff in the shop. Production was also slowed while Berry and I adjusted the technical drawings to correct for the pivot point and the mechanism s. Berry produced drawings for the pivot point and adjustments to the framing. I printed out a scale set of drawings to fill in any gaps in the technical drawings and show how the remaining mechanisms should function. Over break, Berry along with a minimal shop staff welded the majority of the remaining frames. Upon returning from break, I discovered none of the luan stuck to the metal frames. The final solution was to use gorilla glue. During the next two weeks, the remaining walls were constructed and pu t in place. The benches and side facing were installed towards the end of production The original design of the benches changed slightly to make mounting easier. The Visqueen walls were the last element to be installed. The light bounce was greater than expected and additional time was spent covering it in black scrim. Painting was the final step in the process. The paint treatment was simple, but the amount of surface area made it a large task. 18 cut the muslin. We believed we would be able to minimize the appearance of seams by fil ling them in and using a heavily texture paint. Also, at this stage there was no way to seamlessly apply the muslin and the time investment was not worth it. Herring and Berry opted to use glue to attach the luan so that no fasteners would show. Producti on Meetings There were very few production meetings since winter break interrupted the build schedule. A safety concern was brought up by the lighting department. The lighting instruments were placed close to the Visqueen masking and there was a greater risk of fire. There were two solutions. The first was to do a test with normal Visqueen and coat it in Borax. The second, and chosen option, was to order fire proof plastic. Two other set decisions were made during these meetings. They were what type of fan to use to create wind and t he best way to create the snow e ffect. The original fan proved too big so we opted for a small, but powerful floor fan. Snow options ranged from soap based flakes to mechanical drums. Ultimately, we went with ou r original choice of a simple snow bag. The majority of the issues were solved outside of the production meetings. Many problems required us to be in the space and it was not always possible for all production members to attend meetings. The meetings ser ved as a platform to inform the rest of the production team of potential probl ems and how they were resolved. The stage manager, Alexi DuF ries, arranged times to go over the functionality of the set and go over scene shifts with me. Ultimately, the produc tion meetings ran smoothly and were another communication aid. 19 TECH WEEK First Tech and Crew Execution The major elements of the set were in place for tech weekend. Apart from minor adjustments, the only component still missing was parts of the finished paint treatment. All surfaces had a basecoat similar to the final paint color so the lighting and projection design ers would know how it would impact their designs. A couple changes were made to the set regarding aesthetics or functionality. Once the set was seen under stage light, the designers realized there was too much light bounce off the Visqueen masking. Since the masking was no longer used for shadows or projections, I felt comfortable adding black scrim over the top to darken the surface. This di d produce a moir effect, but Dr. Remshardt Lussier and I agreed this was a minimal disadvantage since the set was only backlit during one scene and could not be seen by the entire audience. The shop added several fasteners to keep the shutters closed and the central panel from shifting when people climbed through the window. The fan was cut after the second attempt. The actor did not have hair and was wearing very little clothing so it was hard to tell that there was any breeze. Some of panels would not s tay in their position due to an unlevel floor. Berry applied patches of Bondo to the floor to prevent the castor s from floating. The majority of the scene shifts were actor driven. The actors had been working with the panels and mechanisms since the installation so the transitions went fairly smoothly. The majority of the time spent working on the set was coordinating the crew backstage and spiking the exact locations of the panels so the projection team could perform accurate image mapping. 20 Dres s Rehearsals From a scenic standpoint, the dress rehearsals went smoothly and few adjustments were made. The biggest challenge was creating the schedule for the following day that allowed time for that scenic, lighting, sound and projection departments t o have time in the space. During these last few days, the backsides of the panels were painted and I finished aging the concrete. T he props master, Caitlin Callahan, finished the wanted poster and a steel plate could now be added to the backside of the far stage right panel and a magnet secured to the poster. My main focus during the dress rehearsals was to make sure that the costumes corresponded well with the set. Stafford did an excellent job making the costumes prominent against the grey walls. Stafford and my main concern was that the white tablecloth and chair for the kitchen scene, would be too much white on stage when costumes were integrated Overall, the costumes and the set meshed well with each other. Openin g Upon opening, the set was comp letely finished It was a full house and the audience was genuinely focused on the action of the play. Due to the failure of multiple computers, projections and sound had to be reprogrammed. The design team recovered well, but a little more time would have allowed all of the elements to be finessed. 21 CONCLUSION Roberto Zucco was a strong production for the University of Florida. The majority of the performances were sold out and audiences seemed to be pensive at the end of the shows. The integration of all the technical elements was one of the more impressive aspects for me. The image mapping of the projectio ns to fit the panels added to the total picture. I would have liked to have access to projectors that could cover the entire panel instead of le aving a band on the bottom. Also, it would have been preferable to have had shutters for the projectors in order to have complete blackouts. The sound was truly designed and all of the environmental noises brought the set to life. Lussier, Stafford and I f ollowed through on our design concepts which merged and enhanced the overall production. There were some changes that I would have made to the set. I would have preferred for all of the mechanisms to sit flush with the panels, but I believe I made the right choice in luan. Even though we were able to minimize the seams, the luan warped and was extremely noticeable under top light. I would have liked more time to experiment with the projections. I selected sand as a paint additive to give a concrete texture, and I knew it would take projections well. The sand under stage lights was barely noticeable and a heavier texture would have served the set better. Lookin g back, I would have produced more technical drawings and met with the entire shop staff and to make sure they understood the scope of the project. 22 WORKS CITED Bernard Marie, and Martin Crimp. Roberto Zucco London: Methuen Drama, 1997. Print. ""Robert Zucco" A Funny and Sad True Story | Goldstar." Goldstar | Go Out More Web. 21 Nov. 2011. . "Roberto Succo." Wikipedia, the Free Encyclopedia Web. 21 Nov. 2011. < http://en.wikipedia.org/wiki/Roberto_Succo>. "ROBERTO ZUCCO | Back Stage West | Professional Journal Archives from AllBusiness.com." Small Business Advice | Business News & Articles | AllBusiness.com Web. 21 Nov. 2011. . "Roberto Zucco: a Play by Koltes at the ADC Theatre in Cambridge." Welcome to State of Design UK Web. 21 Nov. 2011. .
67 BIOGRAPHICAL SKETCH Molly Ilten is a native of Cedar Rapids, Iowa. She earned her BS in Mechanical Engineering from the University of Wisconsin Platteville. Throughout her undergraduate years Molly explored various forms of theatrical design and came to the conclusion that it is indee d possible to combine engineering with theatre. To that end, she chose to earn her MFA in Scenic Design from the University of Florida. She has had the opportunity to design five shows at the University: Agbedidi (an African dance show), In the Blood, City of Angels, The Grapes of Wrath and Roberto Zucco. Her work outside academic settings inclu ded the scenic designer and charge artist position at the Arundel Barn Playhouse. She has also severed as a charge artist at t he Wagon Wheel Thea tre, Flat R ock Playhouse, Hippodrome Theatre and Ohio Northern University.